As you can see from the recipe that follows, this cookie dough is very easily put together. If you use almond meal like I did, it saves the step of grinding almonds yourself. Once the dough is mixed together, cover it and let it sit at room temperature for a couple of hours. When it comes to shaping the cookies into their crescent shapes, I grabbed a ball of dough and rolled it and pressed it a bit in my palm to warm it up and smooth it out. Then I rolled it into about a 3-inch or so long log. Bend it and give the ends a little pinch to mimic a crescent shape. At least, that's my interpretation of it! There will be cracks along the bend of some of the cookies. I didn't want to over-handle the dough so I didn't try to mend it or re-roll it too much. They bake for about 25 minutes or so in a 325 degree oven until just lightly golden brown. To finish these cookies, a coating of powdered sugar is classic. So is a roll in vanilla sugar. I choose to dip my cookies in chocolate ganache. In general, I think I prefer dipping most cookies in a thin layer of pure dark chocolate but when I have cream in the fridge, I tend to take advantage of it and make some ganache (tip: extra ganache is great for making hot chocolate). Ganache makes for a thicker coating and takes longer to set but you get a nice shine and don't have to worry about the chocolate blooming (white/grey specks) like you would when dipping with untempered chocolate. For a few of the cookies, I placed some sliced almonds on top of the ganache. Sprinkles naturally come to mind, too. And you don't need to give up on the powdered sugar altogether. Take a piece of wax paper and hold it over the chocolate coated half of the cookie and dust powered sugar over the remaining/exposed half for contrast. Making Christmas cookies is so much fun! Place sugar into the bowl of a stand mixer. Add lemon zest (if using) over top and lightly rub into the sugar until moistened. Add butter, salt, vanilla and almond extracts. Beat using the paddle attachment, on medium-speed, until mixture is fluffy. Add almond meal and flour, beating together until combined. Cover cookie dough and let sit at room temperature for 2 hours. Preheat oven to 325 degrees. Line 2 baking sheets with parchment paper or silicon baking mats. Take about a tablespoon or so of dough and roll it into about a 3-inch or so long log (I find it helps to press the dough together with the palm of my hand, then roll). Bend the log into a crescent shape, pinching the ends a little. You may have some cracks in the dough at the bend and you can try to pinch it together but I wouldn't stress over it. Bake until light golden brown, about 25-30 minutes. Let cool on trays for a few minutes before transferring to a wire rack to cool completely. Suggested decorations: You can dip half the cookies in melted dark chocolate or in chocolate ganache like I did. For the ganache, you will only need about 2 ounces of chocolate (or half this recipe) as the basis. Alternatively, dust the cookies with powdered sugar. If you have vanilla sugar, you can also roll the cookies - while they're still warm - in it. Hi Monica, I am going to bake these beauties for my mother-in-law and send to her. Of coarse I am going to have to bake a batch for ourselves too. Love how you decorated them, they look like something right out of a bakery. These are gorgeous- almond cookies are so dainty! Love the decorating with the sliced almonds :) Pinning! Feels so special when someone says they're pinning something from your blog. Thank you, Medha. I've never made almond crescents before either. They look so pretty and delicious! I love all the holiday cookies this time of year - it's so hard to choose which ones to make. Dipping these in chocolate is such a great idea! I have never made almond crescents before! I absolutely love that you added the almond extract ... I totally sniff the bottle whenever I use it! haha These sound delicious! I agree completely Monica - I adore Christmas baking and especially enjoy new recipes so thanks for these gorgeous cookies! Love the chocolate dipped - because I do love chocolate. I'm getting out the almond extract again this weekend - just can't get enough! Have a wonderful weekend. They are a must during the Xmas season over here. I need to bake a huge batch soon. Sounds great! Does your recipe include eggs or egg yolks? I grew up eating these so this post brought back so many memories! I need to make these this year! Happy food memories are the best, Ashley. Hope you make a batch real soon. What a great idea to add the lemon zest! These cookies look very pretty, especially the ones with chocolate and powdered sugar. Love the black and white look! Fun for the holidays. Enjoy the weekend! Yes, you can taste it and we liked it. Citrus zest just works so well with everything. Nowadays, I always zest and freeze so as not to waste because I always have a use for it. : ) You have a great weekend, too! These looks so good, and being dipped in chocolate makes them all the better! I agree; let's dip everything edible in chocolate right now! Thanks, Monica. Glad you like them. I'm sure your grandma's were amazing! Thanks, Petra. I like the combo of chocolate and powdered sugar, too. Thanks, Pamela. These are just beautiful, and so festive...I love cookie doughs that don't contain eggs, and I adore almond in all forms, so these are right up my alley! These are such classic and delicious cookies, but I've never made them. I should definitely add them to my holiday baking list. Yours look so pretty! Same here - classics I'd never made before til now. I can understand why these cookies are classics. Almond-flavored cookies are my very favorite cookies! Love how you dipped them in chocolate. So beautiful! We do share a love of nuts and almonds are just magical! Christmas baking is the best. 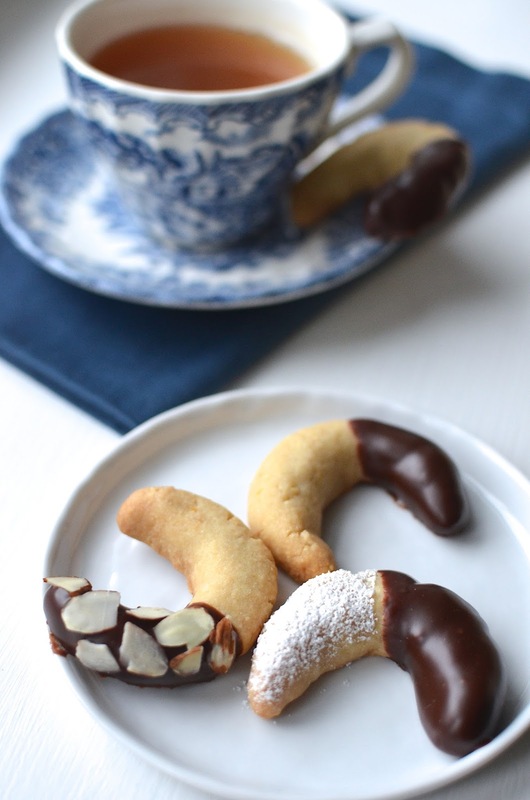 I've never made these almond crescents before Monica, love them. It's a lovely looking butter cookie and dipped in chocolate makes it even more decadent. So pretty and they would be beautiful on the cookie tray. Happy Baking my friend and have a wonderful weekend. I wish I could somehow manage my timing better to bake up all the varieties at the same time to have a massive cookie tray! I usually freeze what I can and we have a little cookie fest on Christmas day with a few different ones...these were a small batch that disappeared quick but I'll have to remember to stow more cookies away.